Though we are not in to this kind of production style, our interest aroused to follow up the transmission of “Germany’s Next Top Model” because Sara was one of the competitors. Sara is a 19 years old beautiful Ethiopian girl from Munich. The host of this TV spectacle is Heidi Klum who is also a popular model in the USA. The process of choosing Germany’s Next Model has taken about three months. Many pretty young girls take part in this controversial test process. The competition is usually said to be controversial because firstly many believe that the theme of the competition doesn’t deserve its name “top model” and secondly many more are sure that none of the competitors has ever succeeded to be a top model after winning. Any ways, many Ethiopians living in Germany were following this program since it was known that Sara was taking place in it. Though they all had a wish that she would be a winner, quite few of them have assumed that that could ever happen. Even though this TV program was not our taste, it showed us the positive social transition that is taking place in Germany. 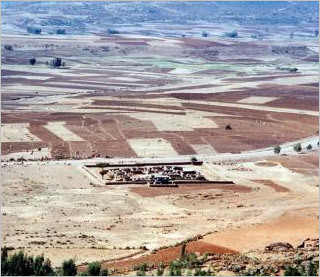 Sara was not only favored by the Ethiopians. Most of her supporters were Germans and people from other communities living here. She has everybody’s sympathy because of her beauty, natural smile and free attitude. The world is reforming it self. A great social change is taking place around us. We are fortunate to be part of this transition. It could be awkward to compare but we want to do that any way and say: Germany has now its Sara like the USA its Obama. There is yet a lot to come. As donors increasingly flee Germany’s troubled UNICEF chapter, Chancellor Angela Merkel joined a growing chorus of luminaries calling for action in response to accusations of mismanagement. UNICEF Germany acknowledged that some 5,000 of its 200,000 regular donors have pulled their support from the charity in response to reports of funding abuses and mismanagement at its highest levels. 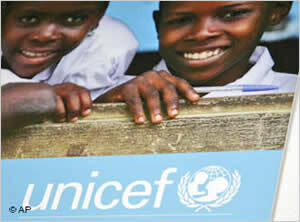 Critics are asking whether enough UNICEF donations are going to help the needy. The national chairwoman of UNICEF Germany, Heidi Simonis, resigned on Saturday, Feb. 2, 2008, after blowing the whistle late last year on the alleged waste of donor funds collected by the body. 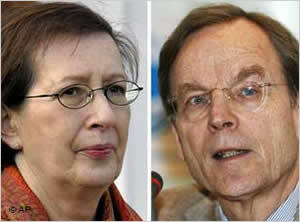 Heide Simonis, a former Social Democrat politician, conceded that her departure after two years in the post was in part due to a bitter row with the head of management at UNICEF Germany, Dietrich Garlichs. She accused Garlichs of failing to face up to allegations of mismanagement. Pressure on Garlichs mounted on Tuesday, Feb. 5, after the press revealed a petition signed by volunteer workers, including the wife of the mayor of Munich. The petition demanded a crisis meeting to deal with the problems. “The leadership has to stop its siege mentality and its diversion tactics,” the press quoted the petition as saying. Critics accuse Garlichs of wearing contradictory hats: He is the head of UNICEF Germany, but also sits on its supervisory board, which makes independent oversight difficult. Television presenter Nina Ruge was among those who signed the petition. She told Bild newspaper co-workers were concerned about the generous salary of a UNICEF worker who was earning 850 euros ($1,244) per day on a two-year contract. “People have a hard time understanding this,” Ruge said. An independent audit carried out last year found no evidence of personal enrichment at UNICEF Germany, but mentioned negligence and irregularities in the running of the organization. For example, auditors noted that management had in some cases failed to draw up proper contracts for co-workers, relying instead on oral agreements. UNICEF Germany is one of the biggest contributors to the UN body’s budget. It has taken in around 100 million euros annually for the past two years. Also on Wednesday morning, Germany’s ambassador to UNICEF, television-news personality Sabine Christiansen, loudly criticized Garlichs’ rule-breaking. She demanded changes in UNICEF’s organizational structure and said she wouldn’t rule out personal consequences for specific board members. Other prominent UNICEF representatives lent Christiansen their support. The manager of the German national soccer team, Oliver Bierhoff, told Bild: “An organization like UNICEF Germany, which takes in 100 million euros per year, has to be led in a professional way.” UNICEF representative Toni Schumacher, onetime goalie for the German national team, demanded the resignation of both the management and supervisory boards. “The people who are responsible should take responsibility and resign,” he said. A spokeswoman for UNICEF, Veronique Taveau, said from Geneva that it was vital to restore supporters’ trust in the German chapter. “We hope that we can put the crisis behind us and move on,” she told the AFP news service. 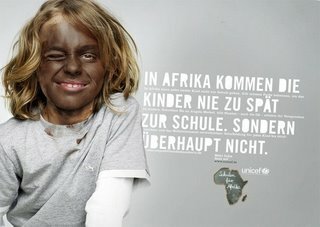 This is an actual ad-campaign by UNICEF Germany! This campaign is “blackfacing” white children with mud to pose as “uneducated africans”. Besides claiming that every single person in “Africa” isn’t educated, and doing so in an extremely patronising way, it is also disturbing that this organisation thinks blackfacing kids with mud (!) equals “relating to African children”. Also, the kids’ statements ignore the existence of millions of African academics and regular people and one again reduces a whole continent to a village of muddy uneducated uncivilized people who need to be educated (probably by any random westerner). This a really sad regression. Bottom lines of this campaign are: Black = mud = African = uneducated. White = educated. We feel this campaign might do just as much harm as it does any good. You don’t collect money for helping people by humiliating and trivializing them first. 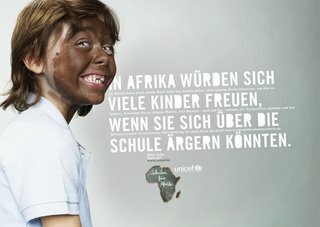 Unfortunately, if it was clear to the average German that this is wrong, UNICEF and the advertising agency wouldn’t come out with such a campaign. 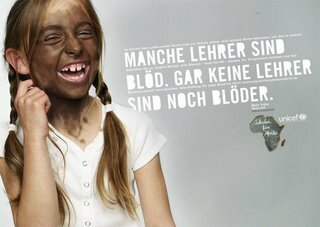 Please write your opinion and help make clear and explain why it is wrong to use “blackface with mud”, and write to UNICEF at publicrelations@unicef.de as well as the advertising agency at info@jvm.de with a copy to Black German media-watch-organization info@derbraunemob.de what you feel about this campaign and why. Please include a line that you’re going to publish your mail and the response. By the way, the slogan of the advertising agency who came up with this, reads “we communicate on eye-level”. 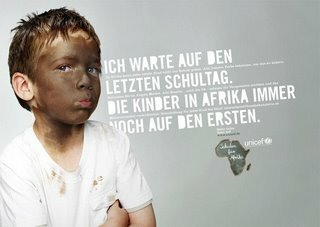 *This campaign of the UNICEF Germany was in Aug. 2007. 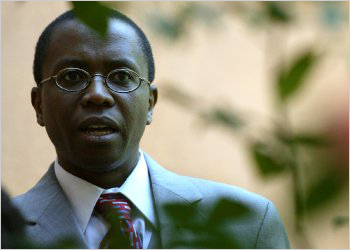 After huge protest from various African communities and human right activists, the organization was forced to take these degrading pictures from its site. But the very fact that such a campaign has been launched by UNICEF is something that shouldn’t have happened at all.